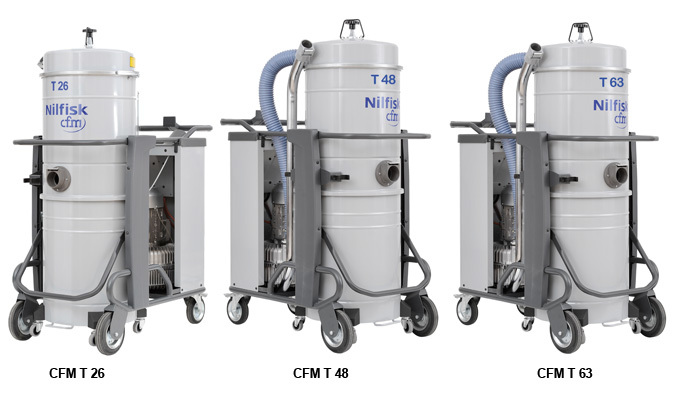 Introducing Nilfisk CFM’s new generation of three-phase industrial vacuums, the T Series. Comprised of the T26, T48 and T63, these reliable machines feature solid construction and strong performance at an affordable price. Ideal for collection of powders, liquids, dust and debris, the vacuums are easy to use and maintain- even in the most challenging environments. Waterlift, controlled 76" 140.5" 82.6"
Dimensions (L x W x H) 44.5" x 23.6" x 60.2" 44.5" x 23.6" x 60.2" 44.5" x 23.6" x 60.2"